The new TYT MD-2017 new version handheld is one of the first dual-band VHF and UHF, for analog FM and digital DMR mode, compatible Tier 1 & 2, TDMA (2 TimeSlot), Motorbro, Hytera. Waterproof (IP67 standard), large backlit color LCD display, keypad, 2200mAh high capacity battery, 3000 channels, 100 000 contacts by firmware upgrade, CTCSS, DTMF, VOX, GPS in option. Multipin connector (specific to MD2017) for external microphone / earpiece and plug in programming cable. SMA female antenna connector. The MD-380 and MD-390 programming cable is not compatible with the MD-2017. New: With the latest firmware, trackball button disable, up to 100 000 contacts, and adding up to 4 different DMR IDs, from the keyboard. Comes complete with: 1 TYT MD-2017 V2 dualband (with or without GPS to choose below), 1 desktop charger 120V-240V (EU socket), 1 waterproof battery (Li-ion 7.2V 2200mAh), 1 dual band VHF/UHF antenna, 1 belt clip, manual in English. 2 year warranty and programming cable include. 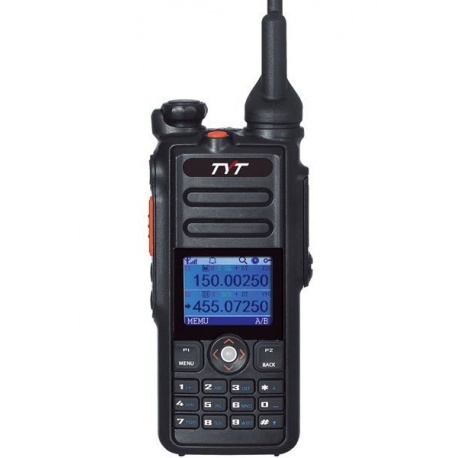 Description: The new TYT MD-2017 new version handheld is one of the first dual-band VHF and UHF , for analog FM and digital DMR mode, compatible Tier 1 & 2, TDMA (2 TimeSlot), Motorbro, Hytera. Waterproof (IP67 standard), large backlit color LCD display, keypad, 2200mAh high capacity battery, 3000 channels, 100 000 contacts by firmware upgrade , CTCSS, DTMF, VOX, GPS in option. Multipin connector (specific to MD2017) for external microphone / earpiece and plug in programming cable. SMA female antenna connector. The MD-380 and MD-390 programming cable is not compatible with the MD-2017. New: With the latest firmware, trackball button disable, up to 100 000 contacts, and adding up to 4 different DMR IDs, from the keyboard. Comes complete with: 1 TYT MD-2017 V2 dualband (with or without GPS to choose below), 1 desktop charger 120V-240V (EU socket), 1 waterproof battery (Li-ion 7.2V 2200mAh), 1 dual band VHF/UHF antenna, 1 belt clip, manual in English. 2 year warranty and programming cable include .